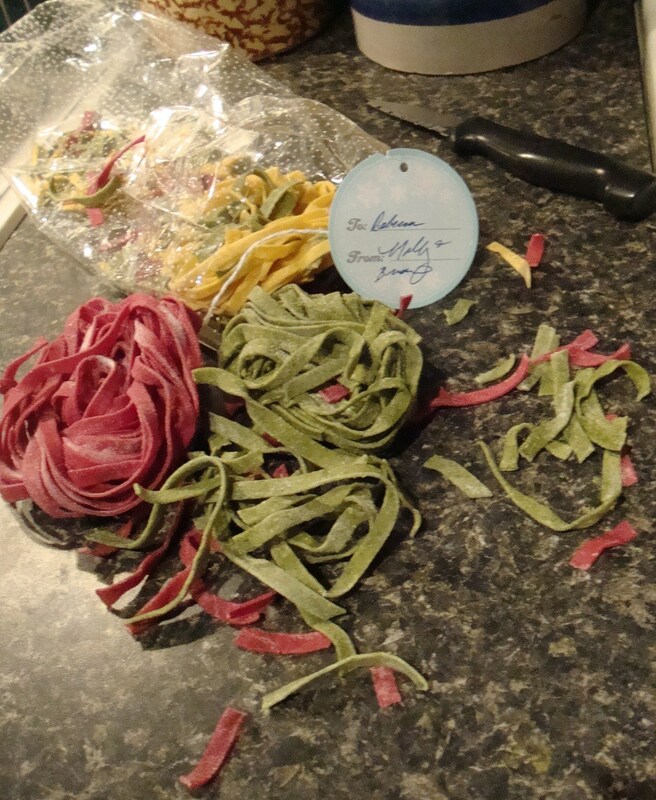 At last, the beautiful, hand-made tricolor pasta from Molly has gone from being admired on the countertop to being devoured on the plate. Tossed it with a cream sauce made with a bit of Asiago cheese leftover from the Savory Cheesecake bake, and added in some smoked chicken. The fettucine took only took a few minutes to cook, and the sauce came together in the meantime. Started by building a cream sauce with a basic roux: To 2 tablespoons butter in a large skillet, added 1 minced shallot, and after letting it soften, whisked in about 1 tablespoon of flour and cooked for a minute or so to incorporate, whisking constantly. Added in about a cup of milk, seasoned with a touch of fresh nutmeg and a pinch of rosemary, and let cook until thickened, stirring occasionally. Off the heat, stirred in about ¼ cup each of grated Asiago and smoked chicken, chopped (D’Atagnan brand makes a good one that’s pretty widely available), and some freshly ground pepper. Added the drained pasta and tossed to coat, using a bit of the reserved cooking water to loosen the sauce. 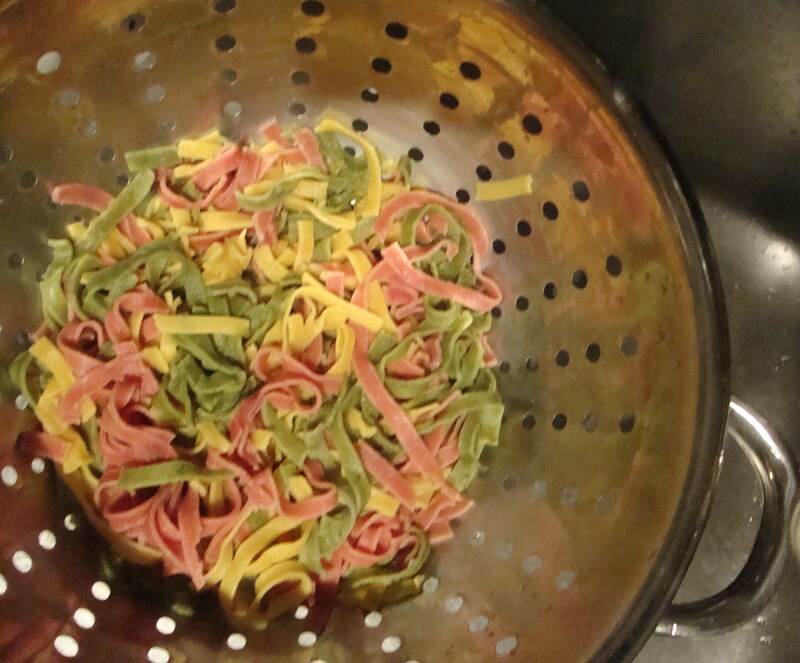 The water had taken on a bit of red hue from the colored pasta, but no matter, it added a subtle pink hue to the final dish. Oh, my. One bite transported me back to the Straw and Hay pasta dish of a favorite restaurant long-gone; the taste and texture were the same. 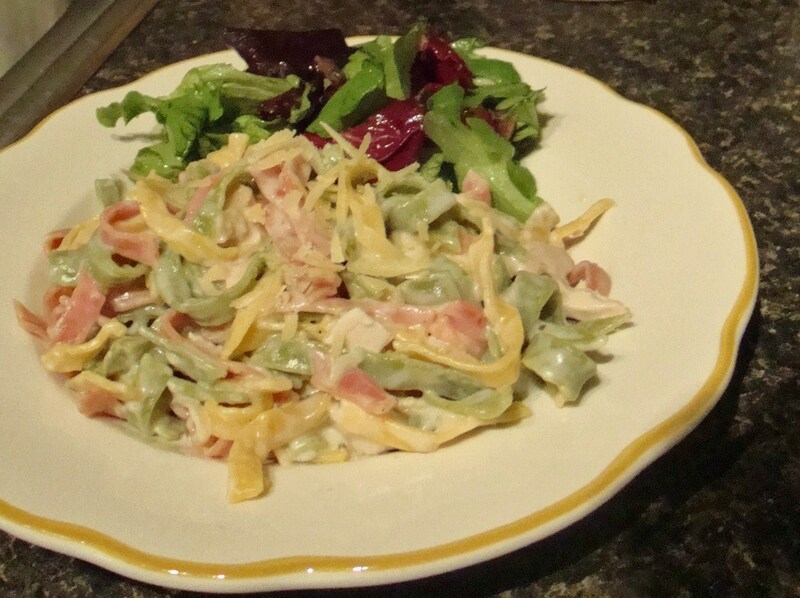 I hadn’t even realized how much I’d missed that combination of spinach and regular fettucine tossed in a cream sauce with bits of ham and lots of parmesan. Bravo, Molly! And many thanks for the home-made gift that prompted my Proustian moment. P.S. I’m guess-timating that the package of pasta cooked up was about one pound. The sauce recipe outlined made enough to coat the strands lightly. So it would be easy to swap out dried pasta. The cheese could also be changed up, and smoked or regular turkey might take the place of chicken. Now go, improvise! Awww, that’s awesome. Thank you! I believe you are mistaken. It should be “the beautiful, hand-made tricolor pasta from Molly” AND BRIAN! Would be great with mushrooms, I’m sure. Glad you liked it.